Whats the weather like in Helsinki? That’s a typical question a Finn travelling abroad may hear. We are a small country and around the world Finland is typically known only for a few things. Like for example sauna, Santa Claus (if you ask a Finn), drinking alcohol, and quite recently raking and forest care as well as the weather of course. 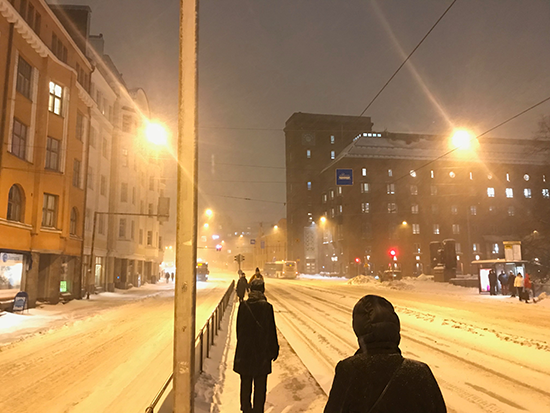 Helsinki, 17:45, January 26.2019Most people can associate Finland with the cold winters we still experience (not as bad as we used to since global warming kicked in). Not everyone knows about the high suicide rates. Even fewer know that as a matter of a fact, after you apply the international “Do I want to kill myself” formula ((-30C * 100 days of darkness * drinking spirits) + high taxes x high cost of living), Finland actually statistically ends up well below the expected mean in actual suicides. But thats another story.. If you are traveling to Finland this winter you should take note of the local conditions – the weather seems to be living up to its reputation this year. We therefore recommend you dress warm and do not attempt to walk home as you leave Crystal Show Club. Be safe.